March 19- At the Music Box in Hollywood, Project Ethos held an evening of emerging artists in music, fashion, and art. The Greek root “Ethos” can refer to “the spirit of a people” and the red carpet event lived up to its lively name. Ethos featured the collections of ten designers, including two from “Project Runway,” Season Six contestant Gordana Gehlhausen and Season Seven contestant Jesus Estrada. 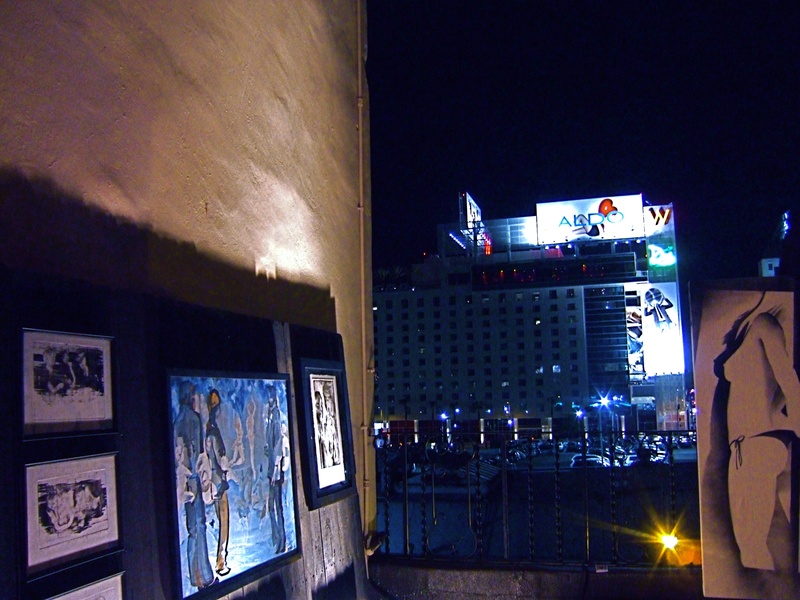 The art gallery on the rooftop, overlooking the new W hotel, proved the most welcome surprise on a warm Los Angeles evening. Artist Erin Hammond showcased a collection of portraits of women. 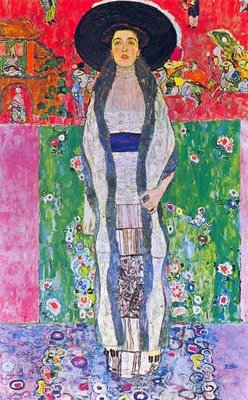 Hammond revealed that Gustav Klimt inspired her. One could see the link between both artists’ vibrant expressionism. On display at Project Ethos was another work by Hammond, revealing a woman’s split soul, two sides of the same coin. The woman’s strong direct gaze suggests a pragmatic nature coupled with the dreamy, fantasy-like motif at the painting’s bottom half. 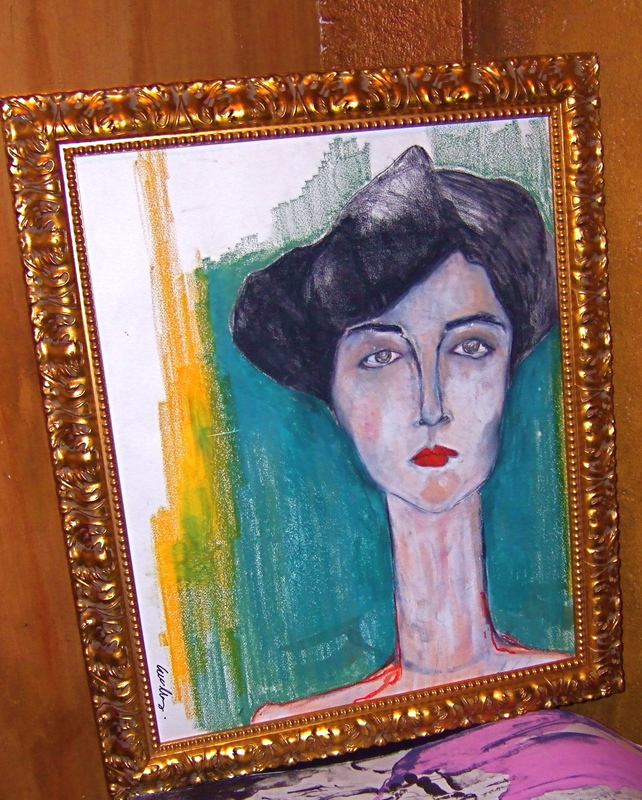 The painting can be read to represent the dichotomy between the Id and the Ego or even the Conscious and Sub-Conscious. Hammond explained that she actually commenced with the bottom half of the painting, before turning it over and realizing its multi-faceted possibility. 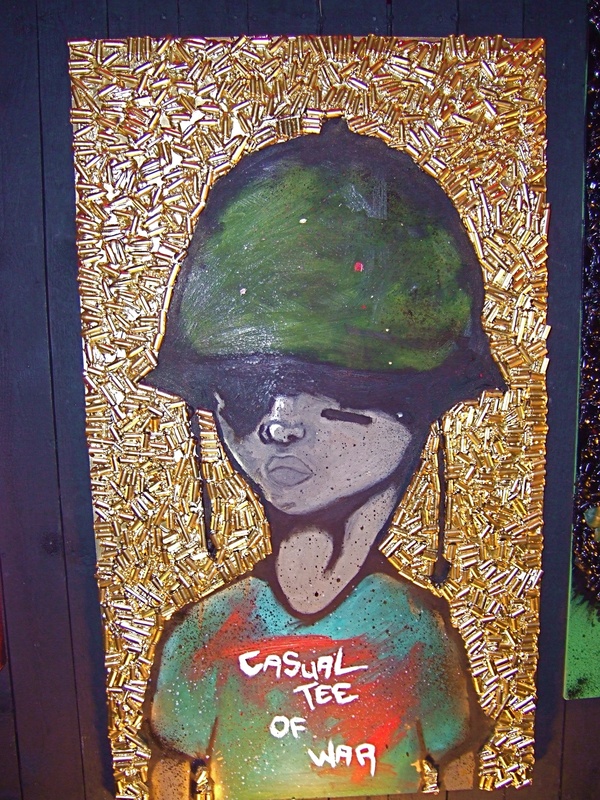 Most striking in its originality was Arnold Randall’s “Casual Tee of War” comprised of bullets, bullet shells, spray paint, and oil on wood. Guests gathered around Randall’s work, unbelieving that the golden, Giotto-like-effect was in fact, composed of ammunition. In his website, Randall verbalizes his subject’s inner thoughts, “We are the untold, the forgotten, our relevance is weaker than the cause yet we are stronger than any bomb…casualties of war.” Though his work, Randall achieves the highest purpose of art: giving a voice to the voiceless. 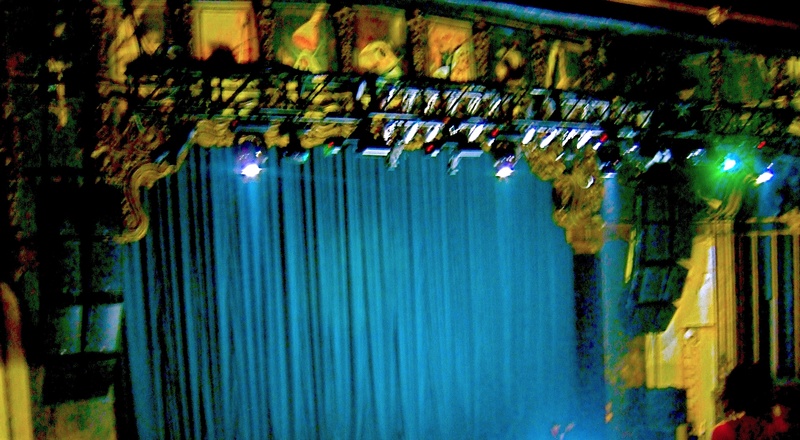 After the art exposition, live performances by Bruno Mars and Love Grenades took place inside the Music Box theater, where unusual paintings lined the walls. 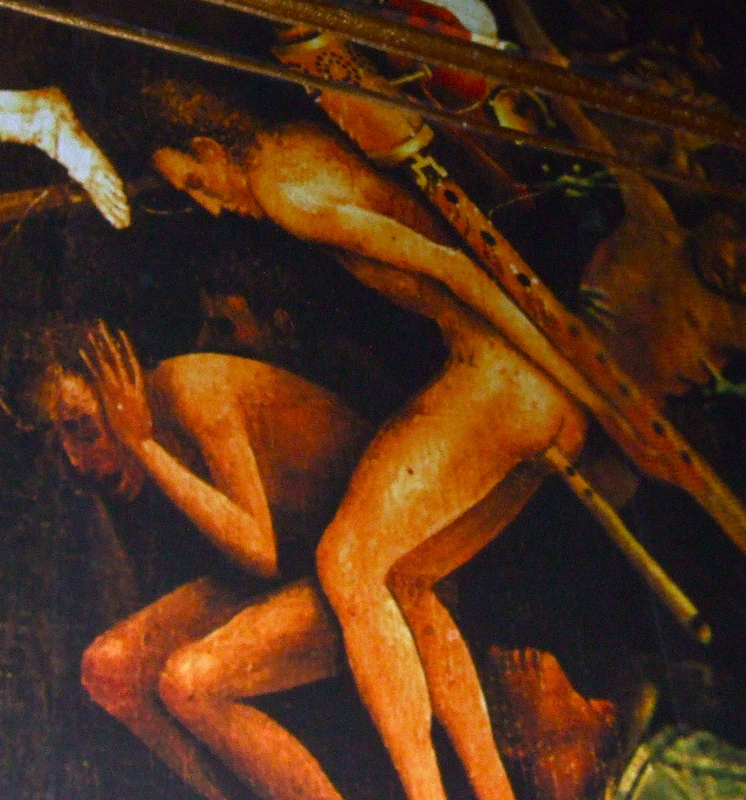 The paintings conveyed the mood of creatures in Dante’s inferno. The final component of the evening consisted of runway shows of ten designers. The most noteworthy for consistency in style were Love Child, which expressed a 1960′s aesthetic and Haus of Estrada, whose Fall 2010 line conveyed an edgy Gothic theme. All of the emerging artists proved that the ethos of self-expression is alive and well in the City of Angels.